The day before you are going to make the dish, sort (to remove stones) and wash the lentils well. Soak them in cold water overnight. The next day, remove any lentils that are floating. Drain and rinse the lentils. Put in a big pot and cover with fresh cold water. DO NOT ADD SALT. Bring to a boil. Simmer 1 hour partially covered. Check to see if lentils are the consistancy (in terms of softness) you like. If not, simmer a little longer. In a pan, put cumin seeds in hot oil for about 1 minute. Add the onions and sauté until they are caramelized. Set aside. 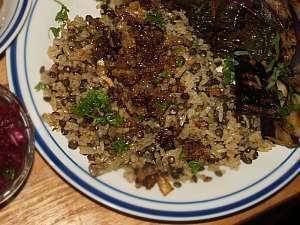 When the rice is done, add the onion mixture and drained lentils to the rice. Mix gently but thoroughly. Warm over low heat before serving. Serve warm or cold with pita bread and cucumbers mixed in yoghurt and seasoned with garlic, salt, pepper and mint, or radishes and green onions, or a cabbage salad. "a spice blend made of cloves, cinnamon and nutmeg. It is very similar in flavor to allspice, which may be substituted for it." But I did a search on the internet of "middle eastern spice mixes" and found reference only to baharat, which has many more than three spices. The Spice House blends "Tellicherry black pepper, coriander, cumin, Ceylon select cloves, Saigon cinnamon, cardamom, Spanish paprika and Chinese Tien Tsin chile peppers." Other sources use dried limes, turmeric... Gernot Katzer's Spice Pages have extensive information on many spices and links to several other spice pages. Mix well (use your second coffee spice grinder) and store in the dark in an airtight spice jar.